Husqvarna SM610 - Chin on the Tank – Motorcycle stuff in Philadelphia. So, anyone who knows me knows that I go through motorcycles faster than most people go through shoes – I’ve had four in the last year. I get itchy feet and am forever on the hunt for my perfect motorcycle. In keeping with that tradition, I recently sold my 2007 Speed Triple to buy a 2008 Husqvarna SM610. I’ve always wanted a Supermoto, and this one came along at a price I couldn’t resist, so I pulled the trigger. 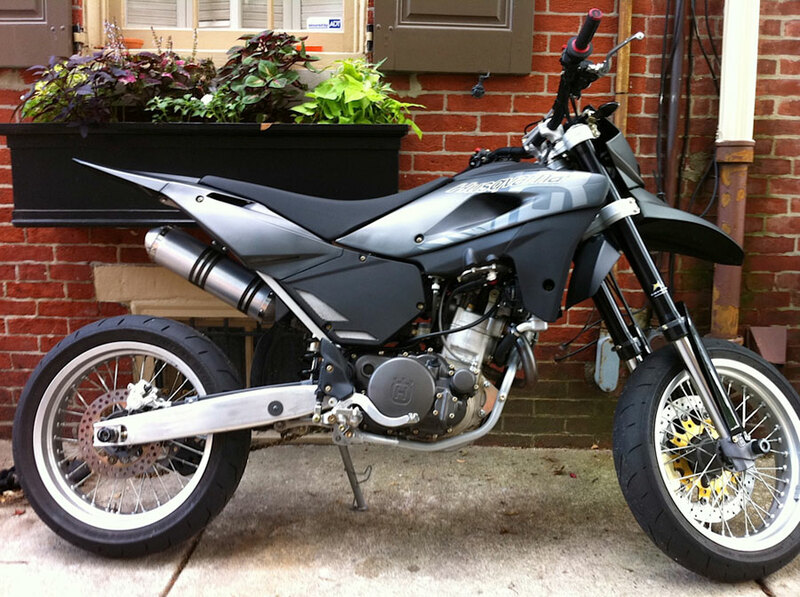 If you don’t know about Supermotards, they’re basically a dirt bike that has sport bike wheels and stiffer suspension. The class was started in the late 70’s as a sort of mash-up for professional Superbike and Motocross riders to race each other on a bike that somewhat melds the two worlds. Since, the Supermoto class has gained a ton of success and has a pretty respectable international racing class today. 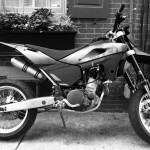 Aside from the crazy hybrid bike design itself, Supermoto’s handle quicker and are typically faster than most other bikes due to their Horsepower/Weight ratio and distinct riding style – they do a lot of sliding/drifting on asphalt. My Husky weighs 290lbs, has 55 horsepower, and 44 ft.lb. of torque. If you do the math, the HP/Weight ratio is nearly unbeatable (until about 80mph). it’s definitely a cool bike. I wanna ride it. keeping with your tradition of going through cycles faster than shoes, I’ll bet money you have either another, or a different cycle before 2011 is over. Anybody else wanna get in on a wager with me for how long Justin will keep this cycle? 1 more bike in 2011 for sure…. I don’t know, I’m pretty into this bike. I really like Husqvarna’s approach to the design. Everything is really well thought out and really done right. It’s been a solid performer so far, and it’s just dirty to ride. I’m really digging it. Have any pictures of some of the motards from the 70’s you mentioned? Be cool to see how they made them and how they compare to a modern design like yours. i love watching the front suspension drop when they get on the brakes before a turn.. congrats on the new bike!